It is with great celebration of more than 25 wonderful years of service that I write to inform you of Kathie Bergman’s decision to retire from her position of Church Administrator in the Fall of 2018. Kathie wishes to communicate her sincere gratitude for the trust and friendship of the UU members during her employment. She plans to remain an active member of the church and to enjoy new opportunities to be of service to the community! I wish to express our deep gratitude for Kathie’s service and for the gifts of both administrative excellence and deep warmth and care that Kathie brought to her role for so many years. We will have a chance to celebrate Kathie’s years of service in the fall. Kathie’s professional gifts and institutional wisdom will be deeply missed, but I feel confident in our ability to locate and hire a successor who will continue Kathie’s excellence. I am pleased to report that Kathie herself will attend to the training of our next Administrator prior to her departure. A search for that person will begin in the summer months. Between now and Kathie’s retirement in the Fall, I am sure you will find opportunities both small and large to appreciate Kathie’s contributions over the years, and I encourage you to do so! with the Rev. Dr. Clanton C.W. Dawson Jr. The Rev. Dr. Clanton C.W. Dawson Jr.
Join us for an exciting adult education series with friend-of-UUCC Rev. Dr. C.W. Dawson Jr. We’ll gather for eight weeks starting Wednesday, July 26 to delve into the history, theology, and culture of the African American Church tradition in America. Those of you who have worshiped with Pastor Dawson know that his engaging style is surpassed only by his breadth of expertise. Don’t miss this chance to learn together. You are welcome to drop in to one, several, or all eight sessions. RSVPs are appreciated but not required. Childcare will be made available upon request with at least one week’s notice. Check out Dr. Dawson’s course description! The original concept of religious spaces as sanctuary for refugees is rooted in Judaism. The ancient Hebrew people allowed temples and even whole cities to declare themselves places of refuge for persons accused of a crime which they may not have committed. This practice allowed those wrongfully accused to escape swift and harsh retribution until they could receive a fair trial. In the late Roman Empire, fugitives sometimes found refuge in Christian churches. Later, during the medieval period, the English common law permitted an accused felon to seek sanctuary in a church, and then choose either to submit to trial or to confess and leave the country. In the United States, the first practical case of anything like sanctuary occurred in the years before the Civil War, when slaves fleeing through the Underground Railroad found safety along the way in churches and private homes throughout the country. Another example occurred during the Vietnam War, when some churches opened their doors to young men resisting the draft. This gave temporary refuge to the resistor, and allowed the congregations to amplify their religious message against war. In the 1980s, refugees from military oppression and civil wars in Central America began to flee to the United States. The U.S. government did not recognize them as political refugees, even though many were threatened by death squads in their home countries. The Sanctuary Movement was born in response, first established at the Southside Presbyterian Church in Tucson, AZ. At its strongest, the movement included over 500 congregations that collaborated to move refugees through the United States to safe houses and safe congregations. Several decades later, beginning in 2007, the New Sanctuary Movement took shape among coalitions of congregations in cities throughout the country. As immigration raids in neighborhoods and work places escalated these congregations opened their doors to provide refuge to those facing deportation. The New Sanctuary Movement helped stop thousands of deportations through case-by-case advocacy. What has been the UU history and tradition of sanctuary? Our congregations have exercised their faith in the inherent worth and dignity of all people since our earliest history by providing shelter and succor to those experiencing oppression. Some Unitarian and Universalist individuals and communities were participants in the Underground Railroad and anti-slavery movement in the United States. The founding of the Unitarian Service Committee was an effort to help migrants and refugees escape Nazi occupation leading up to World War II. And the Unitarian Universalist Association (UUA) and the Unitarian Universalist Service Committee (UUSC) were both deeply involved in supporting the Sanctuary Movement of the 1980s. In January 2017, the UUA and UUSC together issued a new Declaration of Conscience denouncing the first Executive Orders from the Trump administration and calling on our faith communities to translate our values into active resistance. Several UU congregations are currently providing sanctuary, and 44 UU congregations have declared sanctuary status. What would we be asked to do if we decided to become a Sanctuary Congregation? We would first be asked to publicly declare our status as a sanctuary congregation. The more congregations that declare this status, the safer it becomes for congregations and for those seeking sanctuary. We would be asked to be a part of a network of churches and individuals offering public advocacy in support of immigrants, refugees, and others at risk in the current political climate, and to be a part of a network offering education opportunities for individuals to know their legal rights. We would be agreeing to offer physical sanctuary to an individual or family as a legal strategy for negotiating a legal stay of deportation for as long as such a legal process requires. This could be as short as days, more commonly weeks or months, or in some rare instances as long as a year or more. This person would live for that period of time on our property. A request to offer physical sanctuary could come days, weeks, months, or never, after declaring sanctuary, depending on our ongoing local situation and context. Most often, an individual without legal immigration status takes sanctuary as a legal strategy to avoid deportation while negotiations are ongoing. Sanctuary is not an indefinite living situation, but a means to gain some kind of legal status to return to one’s life and/or family in the United States. The Faith Voices Sanctuary network would accept potential sanctuary recipients by standards mutually agreed upon by the network and the sanctuary congregation – such as good potential for legal victory, lack of violent criminal offenses, etc. The sanctuary congregation would always have final say in the matter. Would we be acting alone? Not at all. Our local Faith Voices chapter is creating a broad network of individuals and congregations in Columbia who will provide substantial logistical, volunteer, legal, and financial support to the efforts of sanctuary congregations. In addition, national sanctuary networks provide legal and advisory resources in partnership with churches across the country and large organizations such as the ACLU. 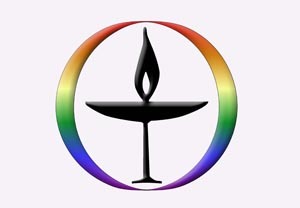 Our Unitarian Universalist Association supports and encourages the work of sanctuary congregations with free consulting and other resources. At this time 44 Unitarian Universalist congregations across the country have declared themselves sanctuary congregations. Can the church as an institution be held legally liable? While there is some risk of the church as an institution being held liable under laws against harboring persons not authorized to be in the U.S., over the last forty years no congregation has been prosecuted for allowing undocumented people to find shelter and safety in its house of worship. In previous court cases in other circuits, harboring has been interpreted to involve the intent to conceal, whereas sanctuary is a public act with no intent to conceal. The federal circuit court of appeals presiding over our area to our knowledge has never ruled in such a case one way or the other. There is no law providing for sanctuary, but Federal agents are advised by longstanding written federal policy that they are to avoid entering “sensitive areas,” including churches, hospitals, schools, mosques, temples and synagogues. Though we do not know if this policy will continue in the current administration, immigration officials know that if they went into a house of worship to make an arrest they would have a public relations challenge on their hands. However, if such a situation were to arise and immigration officials came to a sanctuary church with a warrant, the network encourages that we not break the law by preventing their entry, but rather document, witness, and activate a rapid response network to provide physical presence of protest and press attention to the situation. What about possible legal liability for individual church members? UUCC is registered as a Missouri non-profit corporation. Under Missouri law, individual members cannot be held personally liable for the actions of the church, according to Missouri Revised Statute 355.197, subsection 1. An individual member would only be legally liable if they, personally, decided to break the law, such as by blocking the entrance of law enforcement with a legal warrant. While each individual may make their own choices in such instances, such behavior is not requested or encouraged. What are the practical and logistical considerations? A person entering sanctuary cannot leave the site of sanctuary until their legal case is resolved, unless the person decided to give up and end the sanctuary and risk arrest and deportation, which would be extremely rare. This means the person needs a room to live in, access to food and kitchen facilities, bathing facilities, and good internet. Company is also important and our Faith Voices network is recruiting a large corps of volunteers to provide logistical support such as meals and company. Regarding physical space, we have identified a classroom that is not in regular use and have consulted with facilities volunteers about a strategy to create a showering solution. An individual in sanctuary would require regular access to the downstairs kitchen. We know that living space in the lower level of a church is not ideal for an individual, or for the convenience of church programs. Yet, the alternative in cases of sanctuary is often between an imperfect but compassionate living situation in sanctuary vs. detention with little legal recourse in for-profit and inhumanely run detention centers. We don’t know all of the risks and benefits of an act of faith like declaring sanctuary. We do know that some congregations have received hate mail or vandalism because of their position on this and other progressive issues. Truly, the biggest question for us to consider in this decision is the same as any other act of moral courage: What does love require us to risk? Where does the strength of our hearts meet the calling of our faith in these times? In my sermon on February 19, I announced that our partners at Missouri Faith Voices have invited us to become a part of a local network of congregations offering solidarity, support, and even sanctuary to individuals facing deportation or detention because of their immigration status, religion, or other identity. Your Board of Trustees has charged and authorized our ministries to pursue a process of discernment about whether to declare ourselves as a Sanctuary congregation. 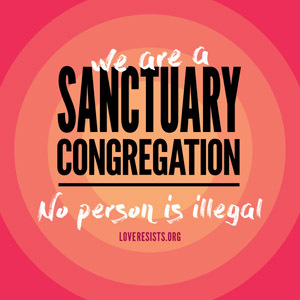 Although we would be the first UU church to declare sanctuary in Missouri, our UUA is a leader in the current sanctuary movement nationwide, and our sister congregation in Denver is currently serving as sanctuary for an undocumented mother and community activist. Our Unitarian Universalist association has a wealth of resources on the work of sanctuary. And our UUA President The Rev. Peter Morales has issued a statement calling UU congregations to prophetic witness in these times. Please join us for one of these two identical conversations as our congregation discerns whether to formally declare ourselves a sanctuary congregation and promise protection to those facing detention or deportation because of who they are, where they are from, or what they stand for. Childcare and light meal provided. If you are unable to make one of these times but wish to join the conversation, please reply directly to me for a potential third opportunity. Thursday evening, March 16, 5:30-7 p.m.
Sunday afternoon, April 2, 12:30-2:30 p.m.
Monday evening, April 3, 6-8 p.m. If further follow up is needed after these two meetings, we will continue the process with further conversations as necessary. After a time of discussing legal and logistical questions, our capacity for risk and moral courage, and the calling of our faith, we will hold a congregational vote about this designation at 10am between the services on Sunday, April 9. If you have questions, please don’t hesitate to contact me or one of the team working on this process: Allie Gassmann, Dave Gibbons, and Janice Smith. I am excited to introduce to you our new Director of Religious Education, Jamila Batchelder. Many of you may know Jamila from her long time involvement in many facets of our congregation – from teaching in our RE program in the Schweitzer class, to volunteer youth advising and coordination of our high school youth program, to facilitating chalice circles for a group of parents and a multi-age group, to acting as worship associate. From these UUCC experiences, Jamila brings a deep love of Unitarian Universalism and an understanding of our programs, our worship life, and congregational dynamics. From her personal life, she brings a multi-faith background, knowledge of many wisdom traditions and spiritual practices, and profound theological grounding. From her professional life, Jamila brings experience as an educator, a researcher, and a coordinator of youth programs, and a proven track record of creative collaboration that is based in relationship and committed to getting things done. As one reference expressed: Jamila brings out the best in people and makes volunteering easy and fun. As you can see from her Philosophy of RE statement, Jamila brings a clear and exciting vision for our program, one cornerstone of which is ensuring that our program is deeply informed by the needs of our young people and families. Jamila is extremely conversant in developmental needs across the age span and has the skills to help ensure the inclusion of children and youth with many learning styles and needs. She brings with her an attitude of empathy and an intuition that we feel confident will serve each unique UU child as they learn and grow as individuals. I look forward to having Jamila as a partner in ministry as she brings her many gifts to the professional staff of our congregation. Jamila will begin work with us officially on November 17. Look out next week for a message from Jamila, and keep an eye out for upcoming opportunities to chat with her about your hopes for our Religious Education program. To learn more about our search process and our efforts to mitigate bias, please keep scrolling! In our governance structure, the hiring and supervision of staff is delegated to the minister. It is highly advisable for the minister to consult with stakeholders about their needs when preparing to make staffing decisions. Particularly with program positions such as Director of Religious Education, best practice involves engaging a team of stakeholders as a Search Team in an advisory capacity. Though the Search Team does not take a binding vote, or make a final decision, their input is invaluable throughout the process. In August I convened a Search Team to advise me in the pursuit of hiring a new Director of Religious Education. This Team included representation from the RE Team, the YRUU advisors, Parents of current RE participants, and those with historical/institutional knowledge of our programs. The team consisted of Joe Collins, Paul Ladehoff, Tracey Milarsky, Dennis Murphy, and Chelsea Otten. Together this team examined our job description, determined it was up to date, and considered how we might weigh our priorities for the position. We advertised the position to the congregation, to the Columbia community (particularly through the local college and university job boards), and to regional and national UU networks. Knowing that we might be considering a church member candidate, and that inevitably such a candidate would have many different relationships with individuals in the congregation and on the search team, we engaged our UUA Regional Staff early and often for advice about creating a process that was as fair as possible in our context. Together, we created a covenant for mitigating bias, which is included below. The team worked diligently to hold one another accountable to this covenant, and I feel confident that the advising I received from the team before making a final decision was careful and deeply considered. I thank everyone for their patience in a process that was lengthened by careful work and the reality of juggling busy volunteer schedules. We will not discuss anything about candidates or the process with others outside the search team, especially the candidates themselves. We will be consistent in process with all candidates, asking the same questions in the same ways as much as possible, knowing that follow up may be necessary. We will verbally remind ourselves prior to each interview and conversation about a candidate to set aside bias as much as possible. Prior to each interview and conversation with a candidate, we will name our emotions surrounding the interview, conversation, or relationship, and we will go through an exercise of setting aside those feelings for a time. We will consider both strengths and weaknesses of each candidate. We will consider relevant knowledge about the candidate in relation to church experience but will endeavor to consciously set aside personal relationships and feelings related to those relationships. In discussions regarding a candidate, we will hold one another accountable to our covenant, naming when we hear comments that engage bias or feelings that could become bias, and seeking to balance those comments with further considerations. The Rev. Dottie Mathews preaches at UUCC. Our faith is one of covenant and relationship, wherein the relationship to the congregational body is a defining one for any minister. And yet we recognize the powerful need for ministry beyond the walls of our congregations and the deep value of those who serve not primarily in the congregation, but in the wider community. We call this ministry community ministry. Community ministers are chaplains, spiritual directors, justice-advocates and activists, non-profit managers, youth mentors, and more. In the Unitarian Universalist tradition, community ministry is celebrated, and it is also, at its best, rooted in congregations, accountable to gatherings of Unitarian Universalists as the central site of our faith. Therefore, it is recommended and encouraged by the UUA, Unitarian Universalist Ministers Association (UUMA) and Unitarian Universalist Society for Community Ministries (UUSCM) that all community ministers maintain an affiliation with a congregation. For any community minister, affiliating with a congregation is a solemn and joyful relationship of accountability as the minister represents Unitarian Universalism to the wider world. For a congregation, affiliating with a community minister means that we are developing a special and mutually deepening relationship with a minister working outside the congregation. An affiliated community minister is not paid staff, and is especially not unpaid staff – in other words, they should not be taken advantage of for their skills. As part of the affiliation agreement, a congregation may agree to compensate the minister for some work performed within the congregation such as guest preaching, pastoral summer coverage, consulting with a lay committee, and more. Any volunteering done by the affiliated minister will be freely offered by that minister and not expected, pressured, or cajoled. In, June of this year, our Board of Trustees voted to enter into a Covenant of Affiliation with the Rev. Dottie Mathews to recognize and affirm her role as a Unitarian Universalist Community Minister, serving the larger community beyond our church. On Sunday, September 18, we shared a ritual of covenant and welcome with Rev. Mathews. We are so glad and grateful that Dottie has chosen our congregation as her church home and as the site of affiliation and grounding for her unfolding community ministry. We know that our identity and commitment as Unitarian Universalists will grow because of our relationship with Dottie and her work in the wider community! It feels as though we welcome the holiday season into a space of turmoil this year, as powerful social movements for change help us question all we thought we knew, as continuing violence and displacement and terror around the world tear at our hearts and souls, as the drums of war begin to beat once more. Yet the stories that human beings have told for millennia in the dark of December are resonant and powerful for just such a time as this: Lamps lit against the dark, great roaring bonfires calling back the sun, a single light that burned on days beyond the possible, a little baby holding the hope of an oppressed nation. These stories all show us something profound about the nature of hope and our capacity to imagine the possibility of a world – and our hearts within it – made whole at last. These stories show us, in each of their traditions, that Beloved Community begins with hope, and can never come to be without it. Join us this month as we grapple with the calling of hope – Where shall we place our hope? How can it be authentic and not false? How does it live with the reality of despair? How do we carry the weight of its burden? How do we share this calling to hope? For five days now, Mizzou grad student and activist Jonathan Butler has engaged in a hunger strike. He has said that he will eat and drink nothing but water until either University of Missouri system president Tim Wolfe resigns or is removed, or until Butler himself dies. This strategy is dramatic and extreme, and I will admit that it makes me deeply uncomfortable. I am worried for Jonathan’s health. I do not want him to die, and a part of me questions the necessity of such extreme action in relationship to the desired outcome. I am fairly certain that I would not be willing to die in order to ensure the removal of a University President. But I also know that in our country, black lives are already at great risk and under extreme threat, and have been for centuries. Most recently, we have learned from the epidemic of police shootings of unarmed people of color that black lives may be taken in an instant for no reason other than a white person’s fear or ignorance, and that those who have taken that life will rarely be held accountable. It is not difficult to imagine that as a black man in the United States, Jonathan already carries a deep experience of the risk of death in a way that is difficult for me to conceive of as a white woman. In light of this, perhaps his hunger strike is not so wildly extreme after all. For many white onlookers, Jonathan’s tactics are creating a moral crisis where we had not previously perceived one. Yet, if we are listening to students and citizens of color – if we are taking them at their word, as we must – we learn that the crisis was already there. Our University was already a deeply inhospitable place to the flourishing of black lives. Our town and our society were already deeply threatening to the thriving of our African American friends and neighbors. I must conclude from this that my feelings of deep discomfort are correct, but misplaced. I must be disturbed not by Jonathan’s tactics, but by the moral crisis from which they arise. Jonathan’s hunger strike, if I will let it, will bring me into a deep and uncomfortable awareness of the threat that black lives face on the University of Missouri campus and beyond. This threat is already dramatic and extreme and Jonathan’s actions point us directly to that reality – a moral crisis that implicates and involves all of us. I met Jonathan briefly last month at a protest regarding the University of Missouri’s decisions to break ties and agreements with Planned Parenthood (and so doing involve themselves in politically motivated attacks on women’s access to comprehensive healthcare). At that protest, Jonathan struck me as extremely passionate, engaged, and rational. He brought to our gathering a necessary and sophisticated intersectional analysis of the twining forces of racism, sexism, classism, heterosexism, ablism and more that have created this moral crisis on the University of Missouri campus, in Columbia, and in our society more broadly. There are those who argue that the demands of the Concerned Student 1950 group are extreme and unreasonable. They argue that the group has been unwilling to engage in dialogue and negotiation with the University. These words convict my heart. In the days when Dr. King wrote these words, direct actions in the South presented almost as clear and pressing a danger of death as Jonathan Butler’s decision to go without nutrition. Those radical acts, now made less extraordinary by the normalizing force of history and the proliferation of movies and books accustoming us to their imagery, probably seemed just as extreme, dangerous, and even unreasonable to moderate whites of the day as Jonathan’s hunger strike may seem to us now. Yet those radical actions – those actual sacrifices by protestors and activists – paved the way for profound, though not sufficient, social changes that we must now continue. There are those who are deeply involved in negotiations and strategizing work with the University of Missouri around issues of race, racism, and justice. These negotiators are playing an important role in working on policy and strategy that we hope will make a difference. We must also recognize that those who dramatize and make visible our current moral crisis, who refuse to be comforted, who refuse to wait, who refuse to negotiate or “be reasonable” are also playing an extremely important role in the pursuit of justice. As a person of faith constantly discerning how I may stand on the side of a radical and inclusive divine love, I find myself called to support the negotiators and the protesters alike (knowing that many, or even most, students and citizens are both all at once). We are called do what we can to ensure that system level policy work is created and enforced and to magnify and affirm the moral dramatization, the divine protest, and the holy impatience of Jonathan Butler, Concerned Student 1950, and other activists. We must not say “wait,” but must join in the struggle. I am praying for Jonathan and his strength of body and spirit. I am praying for his courage and well-being and that of other student activists who have been working alongside Jonathan in standing and working and speaking for justice, also at great personal cost. I am praying for wisdom and conversion on the part of our University leaders, that they might allow their own deep discomfort to open their hearts to new learning about our current moral crisis and new imagining about a better Mizzou and a better Columbia. And I am praying for all of us, that we might, each in our way, find our hearts moved by this time of moral crisis into the work of solidarity, justice, and love. One of my favorite things about the Unitarian Universalist ministry is its commandment, both spoken and unspoken, to always continue learning and growing in spirit, practice, and intellect. These next two weeks, I will be taking the opportunity to do all of the above, as I engage in several conferences and continuing education opportunities. November 2-4, I will be in Hot Springs, Arkansas on a spiritual retreat with 7 other early career clergy, also graduates of my undergraduate alma mater Hendrix College, exploring what it means spiritually and practically to be religious leaders engaged in public life. In 2014, Hendrix received a Lilly Foundation grant to create an Institute for Clergy Civic Engagement to educate clergy and lead them in reflecting deeply on their role leading in congregations engaged with the issues of the day. I am honored to be a member of their first cohort of fellows, and I am excited that the program will support me in growing in this area, as our congregation continues to light a liberal moral beacon for Mid-Missouri. November 4-6, I will be stopping in Springfield, Missouri, on my way back up from Arkansas, to take part in an exciting new new theology conference, Subverting the Norm, which will be engaging with radical political theologies, and where one of my theological idols, Catherine Keller, will be giving a keynote. Many of you have heard me preaching some of Keller’s ideas, and it is an intellectually and spiritually exciting opportunity for me to hear from her in person. I am certain the ideas gathered at this conference will also pop up in my preaching and thinking! Lastly, I’ll be heading to Pere Marquette State park just outside of St. Louis from November 9-12 for my annual Unitarian Universalist study group, Prairie Group. Prairie Group is an historic group devoted to “study thought as it affects religion, religious experience, the church, in any relevant aspect, science, philosophy, political science, history and any other. It has a special interest in worship and the church and its ministry.” It was founded in the mid-20th century by esteemed colleagues and thinkers in Unitarian Universalism, including giant of 20th century UU and liberal religious thought, James Luther Adams. Attending this group each year, I always feel that truly we stand on the shoulders of giants. This year, for the first time, I will be delivering a paper, which I have prepared, entitled “From Tethers of Captivity to Roots of Flourishing: Collective Sin and Mutual Struggle in the Web that Connects Us” Wish me luck! I am so grateful for this rich bounty of learning opportunities and the support of a congregation that helps me to take advantage of them. I know they will enhance my scholarly ministry and give me practical tools, intellectual invigoration, and spiritual renewal to bring back to our work together!